1,000 people work daily at the headquarters of Nestlé in Barcelona, Spain, and the company hosts more than 50,000 visitors annually. This high level of traffic also spills over into the catering and cafeteria areas. These areas have been recently modernised with a range of Altro safety flooring products to provide better service to staff and visitors. An essential part of the refurbishment was the choice of flooring. There was a need for a high design using different colours and shapes, but it also had to adhere to safety and hygiene regulations for dining and catering areas. The project also needed to be completed quickly to minimise disruption to the normal activity of the dining rooms. With 250,000 meals served annually at the offices of Nestlé, Eurest Catalunya, a company belonging to Compass Group, was able to install Altro safety flooring without interrupting the normal business day. In the self service and dining room areas, approximately 1,000m² of Altro Walkway 20 in two different colours and Altro Wood Safety were used. Altro Stronghold 30 was used in the kitchen. 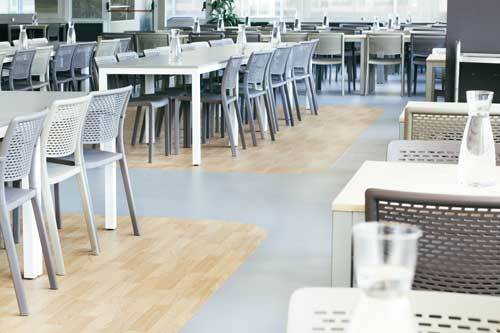 For the cafe on the ground floor, about 200m² of two different shades of Altro Walkway 20 were used. Altro flooring was chosen for its slip resistance, versatility and ease of installation and the ability to create a high spec design without compromising on safety. Jordi Massip, Restoration Supervisor at Eurest, said, “The floor was installed in stages and the dining room was not closed during the installation. The flooring was easy to install, and in two days the area was open and fully operational. 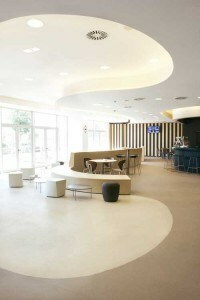 The Altro safety flooring was used to create special effects with the combination of different tones. “Aesthetically it offers many possibilities, and worked well with the new design concept where we wanted to create an edgy line and neutral tones. In the small dining room for executives created to seat 16 people, we installed four rectangular areas where the furnishings differed, and successfully used Altro safety flooring to create a groundbreaking and highly aesthetic area,” Massip said. Daniel Alcaide, from installer Colober Flooring Light, said, “The biggest challenge on this project was to carry out the work without closing the dining room, which meant we had to work in instalments. In the cafe downstairs we used a two colour design, following the pattern of the floor with curved lines, which is only possible with flooring such as Altro safety flooring. “We have maximised the benefits of Altro: safety, ease of installation and aesthetics. As for standards and inspections, with Altro safety flooring there is no problem, as it is always above the requirements of the regulations and that is reassuring,” said Alcaide. Altro Stronghold 30 is Altro’s specialist commercial kitchen flooring, and is ideal for areas where grease, oil and fats may be present. It achieves Altro’s highest rating for slip resistance (TRRL≥55, R12). It is designed to minimise risk in wet and greasy conditions for the lifetime of the flooring. As well as helping to keep staff safe from slips, it also helps reduce their fatigue, thanks to its 3mm thickness which provides noise reduction and comfort underfoot. Altro Walkway is a hugely popular, hard-wearing 2mm safety flooring which provides lifelong slip and abrasion resistance. The range has 42 colours – featuring bright and subtle, sparkle-free designs, and decorative chipped options which give you enhanced design flexibility. When you want to create a homely, comforting and familiar look but you don’t want to compromise on safety, Altro Wood Safety is ideal. The range offers 16 wood-look designs, including classic, contemporary classic and on-trend – so you can vary the mood from cool and classy to warm and nurturing. We think big at Altro – and we’re globally big in premium flooring and wall cladding systems for construction and transport. We love inventing things. Safety flooring and hygienic wall cladding systems are two of our most famous innovations. We really enjoy working in partnership with you, pioneering new technologies and products. You’ve told us you enjoy it too. We’re devoted to sustainability, recycling and reusing our products. Family owned and run, we share family values; we care about you, each other and what we do. We’re passionate about creating a great experience for you wherever you are in the world.